The slow boat down the Mekong river isn’t just a once-in-a-lifetime experience. It’s something you’ll going to want to do again and again. 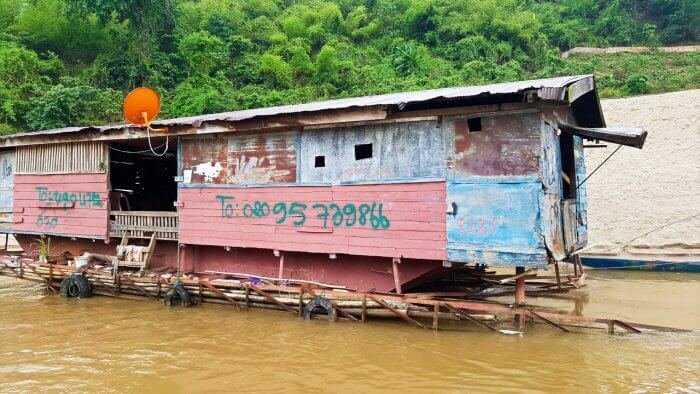 For years, the slow boat was the only way to travel around norther Laos. While it’s recently become a tourist attraction, it’s also still the primary method of travel by locals over long distances. What is the Slow Boat? Perhaps the slow boat should be called the long boat, since it’s not really that slow. The construction is similar to the narrowboat of the UK, with a shallow draft and a large engine in the back. 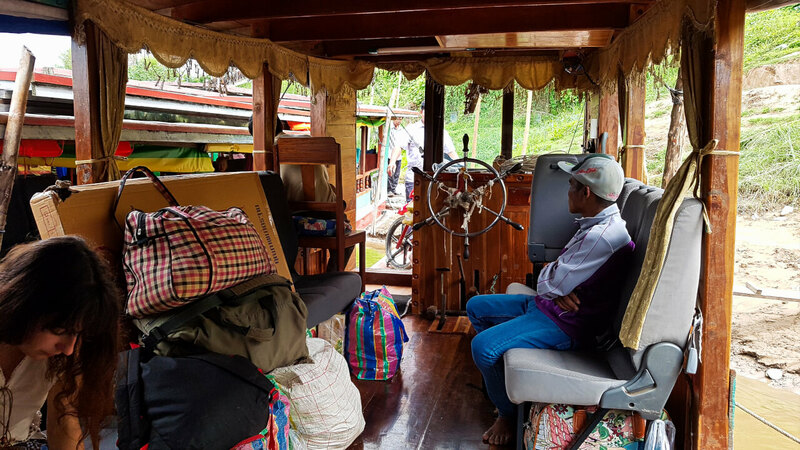 The original construction didn’t include seats, but re-purposed van chairs have been placed in the boat. Fifty of these double seats are available for the journey. A small bar with overpriced food is in the back, as well as a small toilet. Behind the engine is a small room for smoking or playing cards, although you can expect passengers to be smoking throughout the boat. There aren’t a lot of frills for a comfortable journey. If it rains, there are tarps to roll down along the sides of the boat. However, for some strange reason one of the crew members of my particular boat didn’t want them rolled down despite the freezing rain. Aside from an unwritten rule that you can’t dangle your legs outside the boat, there doesn’t seem to be any guidelines. There are three key ways to get to the slow boat. A. Book a tour from Chiang Mai for about 1700 baht (roughly $50). B. Book a tour from Chiang Rai for about 1500 baht (a couple dollars less). C. Book every stage of your journey on your own as you go. Options A and B do not include the $35 Laos visa. If you going for option C, here’s what you’ll need to do. Green Bus from Chiang Mai to Chiang Rai – 129 Thai baht ($4). 6 AM bus to the Chiang Khong – 65 baht ($2). Tuk-tuk to immigration office – 100 baht ($3). 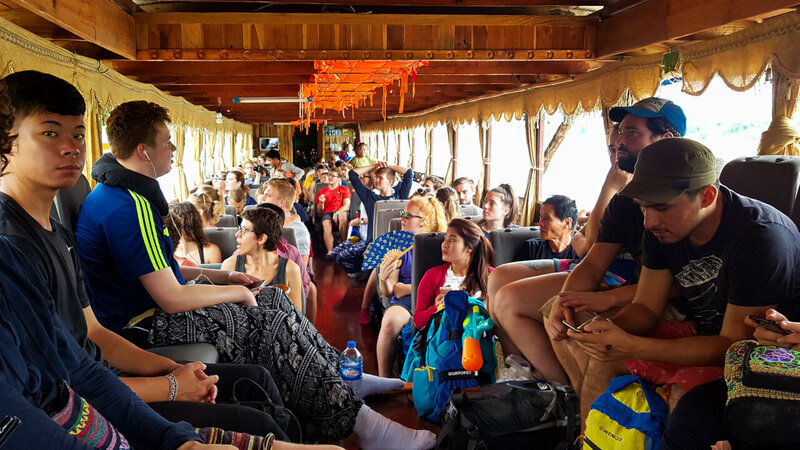 Bus across the Friendship Bridge – 25 baht ($0.80). 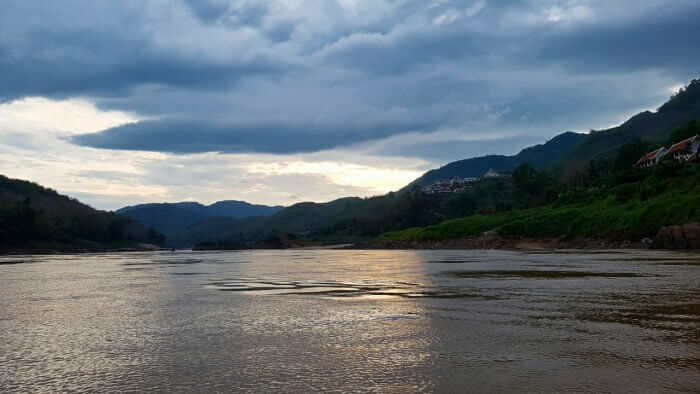 Laos visa – $35 for US citizens. Tuk-tuk to pier – 10,000 Laotian kip ($1). Slow boat ticket to Luang Prabang – 210,000 kip ($20). Accommodations in Pakbeng – 25,000 to 50,000 kip ($2.50-$5). Tuk-tuk from Luang Prabang pier to city center – 25,000 kip ($2.50). Total – $36 without visa. Additional expenses: food will cost about $10 per day. Stock up at a 7-Eleven in Thailand before you leave; they don’t exist in Laos. The food in Laos is more expensive than Thailand, and the food on the boat is roughly double the price of street stalls. Also make sure you pack mosquito repellent, a raincoat just in case, toilet paper if you’re that kind of person and plenty of reading materials or things to keep you occupied for roughly 16-18 hours of voyage time. 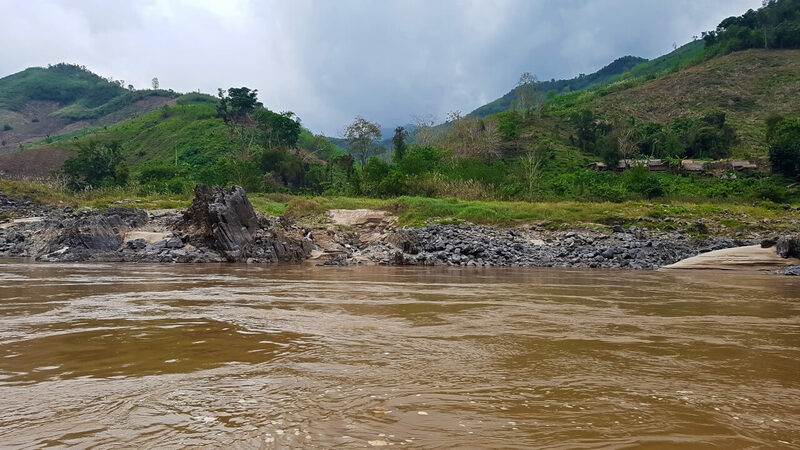 The slow boat is scheduled to leave Huay Xai at the border of Laos at 11:30, but the time is closer to noon. This doesn’t mean you should leave late, but don’t freak out if your immigration process takes a couple minutes longer, or you miss the first bus from Chiang Rai (they leave every half an hour). If you’re doing every step separately, a lady at the border will try to sell you a ticket for the slow boat for roughly 25% more than what it will cost at the pier. Ignore her. Your ticket will have an assigned seat on it, but you don’t have to sit there. By the second day, the numbers will be gone and you can sit anywhere you want anyway. This does mean you have to get there a little early if you want a good seat, but again, there is plenty of time. Once the boat leaves the pier, there really isn’t anything to do except watch the amazing scenery pass by for the next eight hours. The boat will stop every half an hour or so, but only to pick up or drop off locals. There aren’t any towns along the way and tourists can’t get off to stretch their legs. The boat will arrive at Pakbeng around 5:30, shortly before sunset. This “village” is a single street, lined with guesthouses and restaurants solely built to cater to the passengers of the slow boat, headed either to or from the border. You can pre-book on Agoda or with your tour, but you don’t really need to. There’s always rooms available, despite what the tour guides say. Before leaving Pakbeng, make sure to stock up on sandwiches, fried rice, water or whatever else you want to take with you. 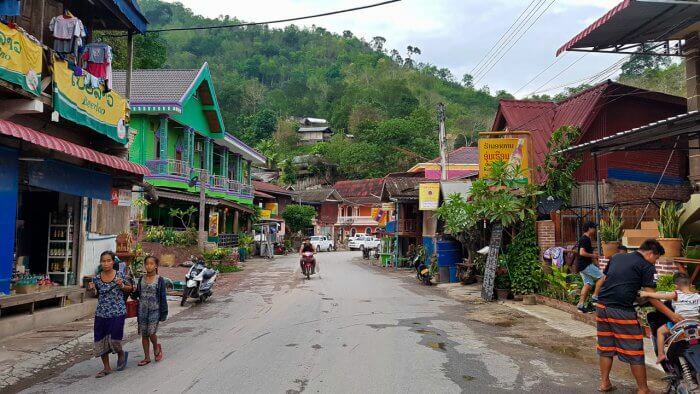 Again, there are no stops until you reach Luang Prabang, and the ride this day is a couple hours longer. 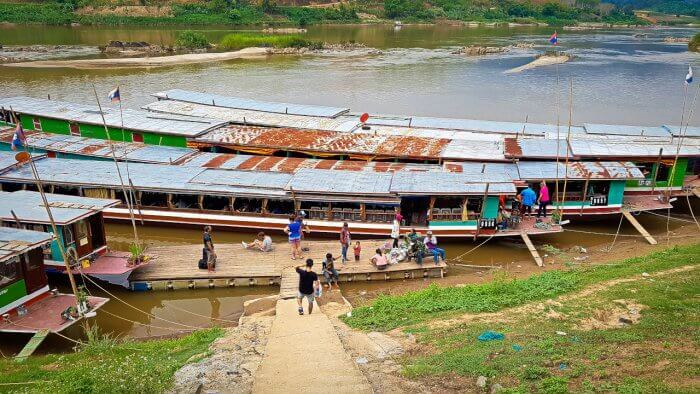 The boat won’t actually take you to Luang Prabang, but rather to a pier 6 miles away from the city. From there you’ll have to get one final tuk-tuk ride for $2, which no one tells you about. Unfortunately, that’s just how things work in Laos. This might sound like a lot of hassle, but the ride is totally worth it. On my trip, I was able to see animals along the shore every minute or two of the entire voyage. These included cows, goats, water buffaloes and even elephants. 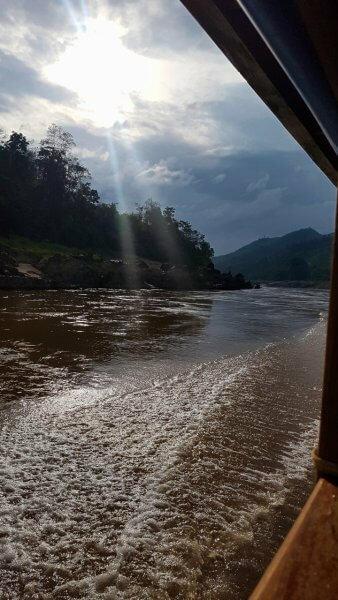 You are sailing through pristine jungle, and the landscape is simply mesmerizing. I know it’s my personal opinion, but I found it really easy to lose track of time just watching the landscape drift by. 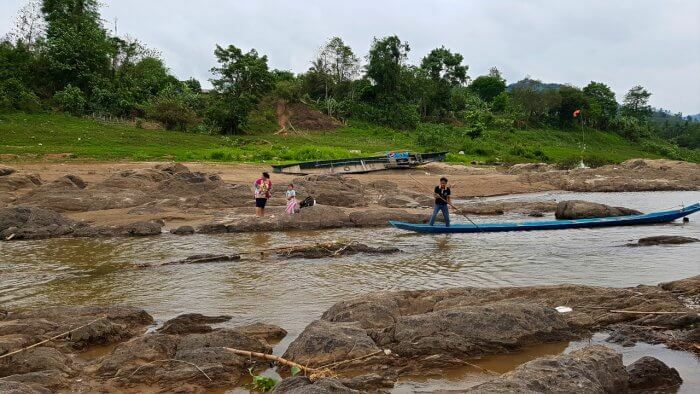 Laos is very definitely a third-world country. The infrastructure is extremely basic. With tourism as the apparent basis of the economy, prices are considerably higher than in Thailand. Yet along with that lack of development is a country saturated with beautiful, unpolluted nature and wildlife. I’ve completely fallen in love with this country, and I’m sure you’ll do the same. 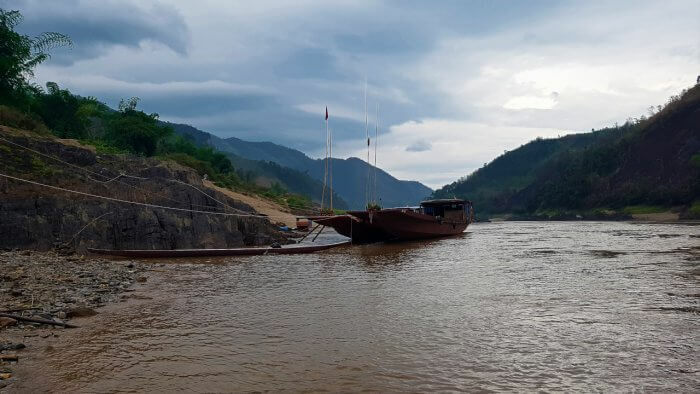 I’m already planning my next slow boat trip down the Mekong River. Maybe I’ll see you on it! What if Your Hotel Had Its Own Winery? It looks like this trip has gotten a lot more comfortable over the years. When I did this trip ages ago, it was just wooden plank seats all those hours. Glad to see the scenery hasn’t changed much though. I was on the same boat in 2000. Heaven. Two days of it. I’m actually planning to do it again in a couple months!